Can Aldrick Robinson's role go beyond deep threat? There are the only three players ahead of Vikings' receiver Aldrick Robinson in number of touchdowns on deep-ball passes this season. Pittsburgh’s Antonio Brown, Seattle’s Tyler Lockett and Kansas City’s Tyreek Hill. According to Pro Football Focus, those are the only three players ahead of Vikings receiver Aldrick Robinson in number of touchdowns on deep-ball passes that travel 20 yards or more. Brown has eight, Lockett seven and Hill six. Robinson has four and is tied with teammate Adam Thielen and Tampa Bay’s duo of DeSean Jackson and Mike Evans. Of all those players, Robinson has been targeted the fewest number of times (10) on deep balls. Five were catchable, meaning he dropped one. His only drop of the season. Overall, Robinson has been targeted only 26 times with 17 catches for 231 yards (13.6) and five touchdowns. He’s seventh on the team in receptions and third in touchdowns behind Thielen (nine) and Stefon Diggs (seven) despite not being signed until after Week 2. When the Vikings were looking for a receiver back in Week 3, Robinson stood out because he had played with Kirk Cousins in Washington. His speed didn’t hurt him either. 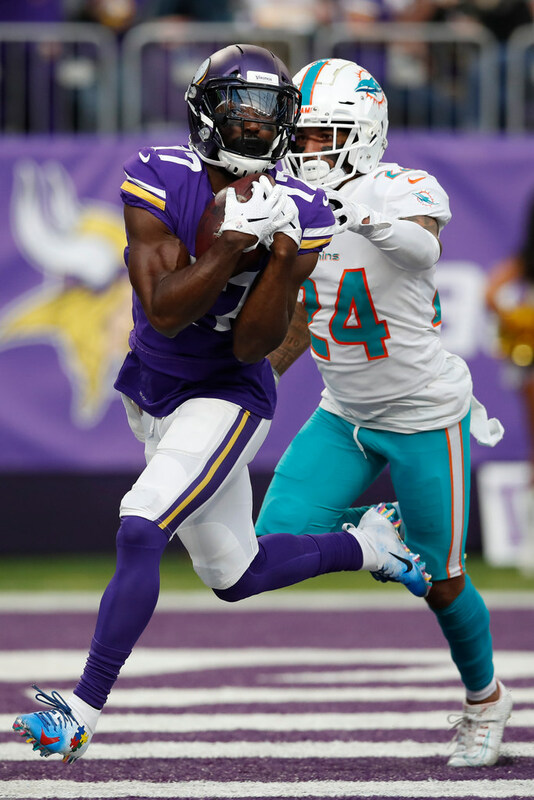 With former first-round draft pick Laquon Treadwell still being slow to develop, should Robinson be playing more and seeing more passes come his way? Is he comfortable enough in the offense to handle more than his current role? It seems logical to increase his role with a slower Treadwell having only 34 catches in 46 targets for 295 yards (8.7), one touchdown and five drops. Something needs to be done to divert some of the defense’s attention away from Thielen and Diggs. Something like Robinson’s 40-yard touchdown in Sunday’s win over the Dolphins. Robinson has a touchdown every 3.4 receptions. That’s third in the league behind Seattle’s Jaron Brown (2.4, five TDs) and Cincinnati’s John Ross (3.2, six TDs). Former Chiefs running back Kareem Hunt is fourth (3.7, seven TDs) while the Chargers’ Mike Williams (4.1, nine TDs) is fifth. Zimmer was asked if he’s ever had a guy whose touchdown ratio was as high as Robinson’s.